Betfair, the world's largest betting exchange, has leveraged its designation as an official partner of Manchester United with flashes of brilliance over the past few weeks. 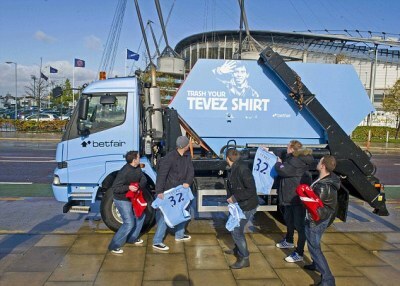 With the Manchester Derby set to take place in just a few days, Betfar found a creative way to capitalize on the only thing that unites Manchester United and Manchester City fans - their hatred for Carlos Tevez. 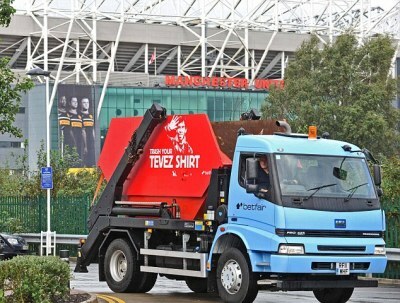 Tevez, an Argentine striker who left Manchester United to join Manchester City in 2009, has become the most hated man in Manchester after refusing to come off the bench and play and will soon be on his way out of town. 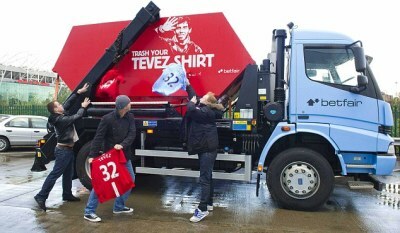 Betfair celebrated Manchester's united hatred for Carlos Tevez by creating a "Trash Your Tevez Shirt" initiative that features a trash truck, branded ManU red on one side and Man City blue ont he other, driving through Manchester rewarding any fans who trash their Tevez jersey with a brand new one. Betfair's PR stunt has attracted a notable amount of worldwide attention and will likely be something that soccer fans in Manchester will remember for a lifetime. In late September, Betfair teamed up with several of Manchester United's star players to create a "Stars and Strikes" campaign that allowed fans to bet (for fun) on which player they thought would win in a game of football bowling. As part of the challenge, Betfair gave Ashley Young, Dimitar Berbatov, Patrice Evra, and a few others 40 seconds to try to knock down ten pins using lightweight footballs.